They Had No Names is a compilation of Heavydeath’s 6th and 7th demo, both classified under the utilitarian title Demo VI and Demo VII. Both past and present demos seem to have come from the same sessions, which where recorded in the spring of 2014. 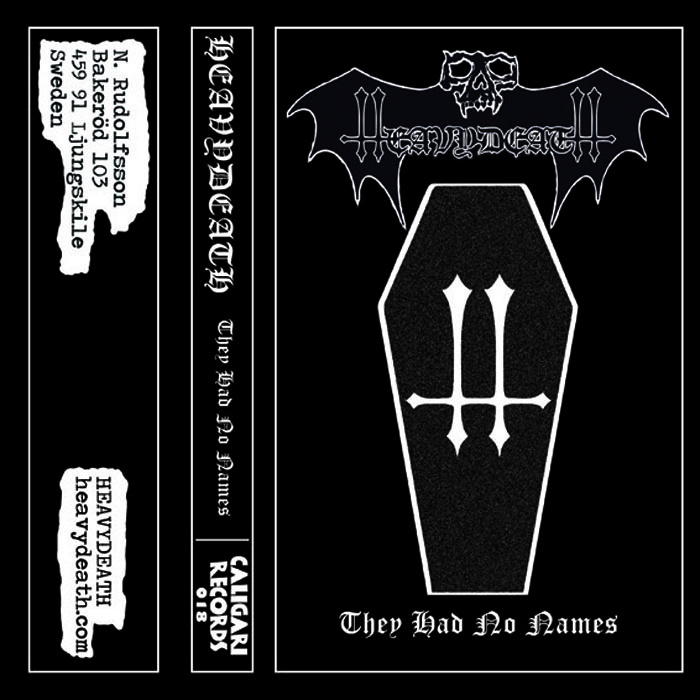 All four songs present on They Had No Names continue Heavydeath’s short tradition of combining the ferocity of death with a doom groove that is undeniably catchy. The droning vocals in “Phase Collapse” feel like echoes reverberating off a crypt vault ceiling. Even in the eponymous track, name? ?, Nicklas Rudolfsson’s festering vocals pound away at wooden doors, though not for one second is it displeasing. I have said many things about this band in a past review and They Had No Names is yet another great example of the gold one finds when mining the internet for long enough. This string of demos is leading up to a full length in 2015 sponsored by the venerable Svart Records. The band not only releases new songs, but also takes time to record and rework other tracks as if to better themselves for a big celebration. If these demoes are just a warmup for the band then my geeky obsession with them has just turned into fervent fandom. Heavydeath and Caligari have made 2014 a horrible time to be alive and I hope for more gloomy weather in the future.